In this article you will learn about sitemap, why you need a sitemap, how to create a sitemap in WordPress, and how to tell search engines about your sitemaps. Today sitemaps are published in XML instead of HTML and their target audience is search engines and not people. There are several ways to create an XML sitemap in WordPress. 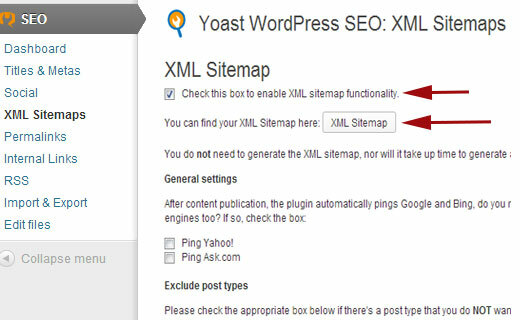 To add a sitemap to your WordPress site, first thing you need to do is install and activate WordPress SEO by Yoast plugin, you can get one here or here. Note: By default, WordPress SEO does not enable XML sitemap functionality, so you will have to turn it on. To do that go to SEO » XML Sitemaps and check the box to enable XML sitemap functionality. ==> Go to Google Webmaster Tools. If you are not already signed in to your Google account, then you will be asked to sign in. After signing in you will reach webmaster tools. There you will see “Add a site” button, click it and then add the URL of your website. ==> On the next screen you will be asked to verify the ownership of the website you are trying to add. There are several methods to do that. But since you are already using WordPress SEO plugin, then the easiest method for you is to copy the HTML Meta tag value and paste it in WordPress SEO plugin. To do that click on Alternate methods and then on HTML Tag. You will then see a line of HTML Meta tag code. ==> Copy and paste this line in a text editor like notepad. Now copy the value in the content=”” (Without copying the commas). Leave the webmaster tools site verification page open because we will come back to the page after adding the meta tag to verify the ownership of the website. Go to your WordPress admin area and then click on SEO tab. This will take you to WordPress SEO plugin’s dashboard. Scroll down, and you will see Webmaster Tools heading. Paste the meta tag value you copied next to Google Webmaster tools and Save Settings. ==> Go back to Google webmaster tools, site verification screen and press the verify button. You will see a notice like “Congratulations you have successfully verified your ownership of www.yoursite.com”. 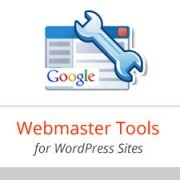 Click continue to see webmaster tools dashboard for your site. ==> On the next screen you will see Sitemaps column with no sitemaps in it. Clicking on it will take you to a Sitemaps page where you can add your sitemaps. Click on the red button labeled “Add/Test Sitemap” and provide the URL of your sitemap. ==> Once you have successfully added your sitemap, it will appear as pending. It will take Google sometime to crawl your website. After a while you would be able to see some stats about your sitemap. It will show you the number of links it found in your sitemap, how many of them got indexed, a ratio of images and web pages, etc. ==> Visit Google Webmaster tools often, at least once a month. As your site gets older you will start seeing more and more useful data about your website and how it is seen by the search engine. I hope this tutorial have helped you. This information can help you learn how well your site is doing and what other things you can do to improve its performance in search engines. If anyone fined any difficulty then don't be shy to make use of the comment box below.